These are made with 18 gauge wire rather than the standard 20 gauge earwire size for those with larger piercing holes. 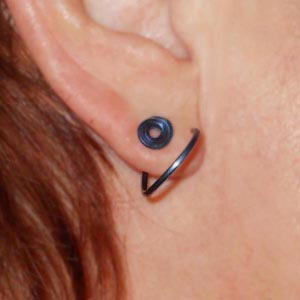 For those with unstretched or standard piercings these will be difficult to insert and uncomfortable to wear. 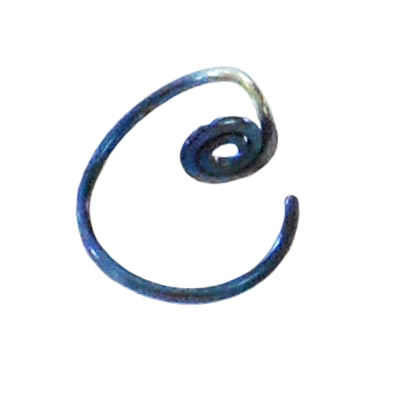 These earrings are made with Grade 1-- the purest grade -- Titanium wire which has been refined and hand worked to form these unique titanium hoop earrings then heat treated for the blue coloration. 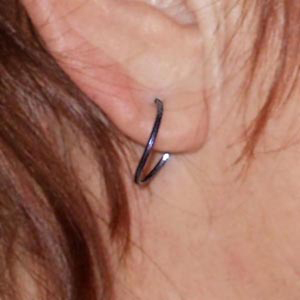 Titanium is not a ductile metal such as silver or gold and Linda has performed the impossible by creating these beautiful titanium hoop earrings. These hoop earrings are feather light and versatile The small spiral can be worn snug to the back of your earlobe or visible in front.